The normal prostate and most prostate tumors contain a small number of cells called luminal progenitors that, unlike the bulk of cancer cells, are generally dormant. They behave like stem cells, lacking expression of the molecules targeted by current cancer treatments. As a result, these cells evade prostate cancer treatments such as chemotherapy and radiation, which generally target and eliminate cells that are rapidly multiplying and dividing. Unlike most prostate cancer cells, these dormant, stem-like cells are also less dependent on androgens, making them relatively unresponsive to chemical castration or hormone therapy, approaches designed to "starve" tumors by depriving them of their androgen fuel. 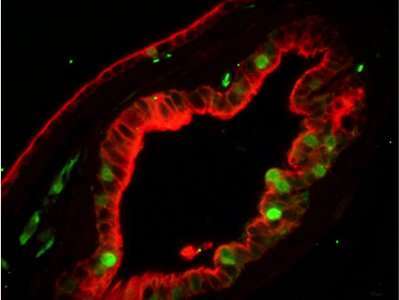 "The existence of a population of quiescent or slow-cycling cells in the prostate has been suggested, but their identity and characteristics were unknown because they are rare and very difficult to study," explains Dingxiao Zhang, Ph.D., an Assistant Professor with the Department of Pharmacology and Therapeutics at Roswell Park and first author on the new study. "We were able to identify a unique population of cells that might serve as the origin of treatment-resistant prostate cancer. Our genetic model paves the way toward the next step, which is the development of therapies that can target these dormant cancer cells, which are expected to significantly improve the treatment of prostate cancer and delay or even prevent its recurrence." I was buying a generic brand from the grocery store, and the best prostate supplement amazon had was this one by alpha rise prostate health. My amazon prime orders always include it in my monthly haul.